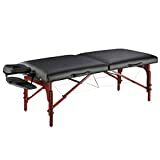 Whether you are a student practitioner or already have a seasoned practice, the right quality massage table is an essential practice necessity. From masseurs and therapists to sport medics, finding the right one is a sound business investment and there are a host of massage tables on the market suited to the type of treatment you offer. To help you quickly decide on the best massage table for you, we have put together this massage table buying guide to ensure both you and your clients will be satisfied with your purchase! Massage tables are divided by their build and by their upholstery, with the main types being either wooden or aluminium framed, and PVC or PU leather upholstered. 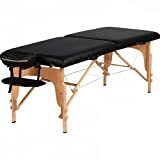 Wooden Massage Tables: Sturdy and strong, wooden massage tables have been a popular choice for professional masseurs for years. A traditional choice that won’t squeak as some older metal designs do, wooden massage tables are ideal if you don’t need your table to be too portable. Aluminium Massage Tables: These latest massage tables have only been on the market for the last five years, and offering a lightweight option without compromising on strength. This new, modern build is fast becoming the top choice for travelling masseurs. PVC Leather Massage Tables: PVC leather is synthetic leather and is often used to upholster massage tables. Because this kind of upholstery is oil and waterproof, cleaning PVC is quick and easy, making them a great choice for busy practices. 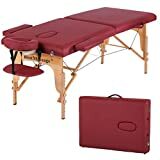 PU Leather Massage Tables: PU synthetic leather is the closest to real leather you can find and massage tables upholstered with it are strong and durable. Boasting a much more comfortable feel against skin, they are a comfortable massage table that clients will enjoy. Setup: Massage table owners rate their purchases much higher when the tables are easy to setup. This is of particular concern to traveling masseurs who need to set up tables frequently. 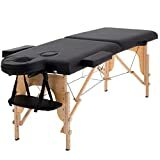 The simpler and quicker a massage table is to set up, the better the reviews. 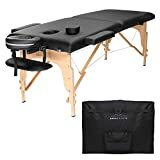 Comfort: Comfort is a big talking point among massage table purchasers, and tables that create a comfortable experience for their clients are top scorers. Online reviewers with tables that are soft yet firm are the most satisfied with their purchases. 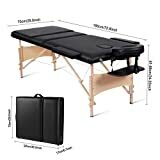 Weight: Satisfied massage table reviewers note that their tables are lighter than they expected but still very sturdy to ensure stable treatment for the clients. 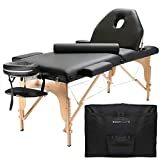 Finding a top rated massage table with good product reviews will ensure the same product satisfaction. 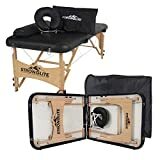 Additions: Additions to massage tables that commenters note add function to their table include a headrest, armrests, arm hammocks, semi-circular supporters, and a carry bag. 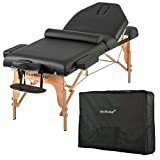 The more additions a massage table includes, the more comfort it brings to the measures and the clients, and the more positive the comments are. One of the main considerations when choosing a massage table is the working weight. The working weight is the combined weight of the table and the weight of the person who you are treating. The higher the working weight, the more robust your treatment can be and the greater the variety of people you can treat. This is a particular concern when doing treatments such as Shiatsu where masseurs stand on the table during a massage. 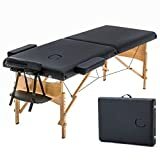 How portable do you need your massage table to be? The higher the working weight of the table, the heavier it will be, and table weights range from 20 to over 50 pounds. If you are planning on making house calls and traveling with your table, this is an important deciding factor that shouldn’t be overlooked. A massage table should be narrow enough for comfortable body positioning yet wide enough to hold a variety of body types. It is also important that you can get close enough to take to effectively massage without discomfort to you and your client, so it is also recommended that you put your own height into the deciding mix. The most popular tables are from 28 - 30 inches wide but sizes range from as small as 25 inches, which is better suited for shorter masseurs. Massage table padding will differ in softness and thickness. Thickness or density ranges from 2 - 5 inches and the firmer the padding of the massage bed is, the more durable it will be. Different massage techniques require different firm/soft specifications and choosing the right density is dependant on what kinds of treatment you plan on doing. Softer, more comfortable padding is better for Swedish massage techniques while harder padding is the ideal surface for sports massage. A massage table however, needs to have at least a 2.5 inch padding thickness to ensure the comfort of the client. The average length of a massage table is around 73 inches - without taking into consideration an extending face cradle. The longer the massage table is, the less likely you are to have a problem with taller clients being left with their legs dangling off the table. 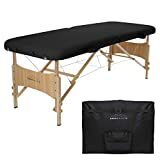 A good massage table will offer you a wide adjustable height range which will allow you to find the perfect table height for comfortable massing. There are two height adjustment options for massage tables: either by using a twist knob to adjust height, or by extending telescopic height adjustments as found on aluminium tables. The last thing worth considering when choosing your massage table is the stability. A worthwhile feature of a portable massage table is a tensor cable support system. This will make your table more portable and also prevent the table from collapsing during a treatment. Sierra Comfort: Sierra Comfort is a premier massage equipment manufacturer that aims to provide a one-stop shop for therapists, trainers, masseurs, and medical physicians. BestMassage: From oils to massage tables, BestMassage are committed to providing quality massage products at the best prices possible. 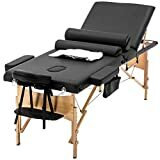 EarthLite: EarthLite offer lifetime warranties of many of their products and pride themselves on creating quality, handmade, earth-friendly massage tables suited for all kinds of therapy needs.